As you all know, I’m a big fan of education. One of the best ways that I know to pick up a new language or library is to use one of the really awesome ‘koans’ tutorials that are modeled after the first: Ruby Koans, by EdgeCase. So what are Koans? Well, there’s been a long tradition in hacker culture to make references to eastern religions; we’ve got Perl Monks, the Tao of Programming, for instance. Back in 2003, esr wrote the UNIX koans of Master Foo, which told the story of various students becoming enlightened. Ruby Koans (and others) continue to enlighten students to this day. So of course, it’s completely obvious to you that koans are a set of unit tests that ask you questions about the nature of the uni…err, programming. 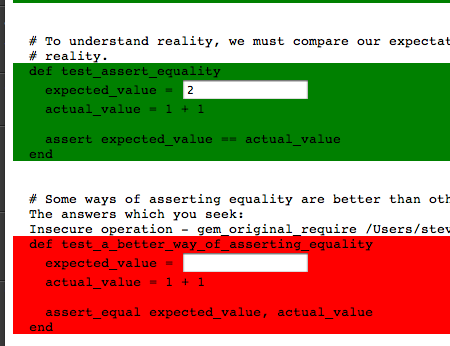 AboutAsserts#test_assert_truth has damaged your karma. There are a bunch of these tests (274, at the time of this writing), and they’ll walk you through a bunch of things you’ll need to know if you want to program with Ruby. This has sort of taken off as a meme, a GitHub search for ‘koans’ shows 92 repositories, most of which are variations on this idea for many different libraries and toolkits. You can then hit a ‘meditate’ button and it’ll change them over from green to red. Fun! It’s still very much a work in progress, it seems: You can see the start of an error there about an ‘insecure operation.’ But otherwise, it’s mostly functional.